LA MALBAIE, Quebec — President Donald Trump delivered a stern warning on trade to foreign countries at the Group of Seven summit on Saturday, advising trading partners not to retaliate against U.S. tariffs on the imports of steel and aluminum. “If they retaliate, they’re making a mistake,” Trump declared. Trump told reporters he pressed for “fair and reciprocal” trade practices at the G-7 meeting in Canada, urging his foreign counterparts to eliminate all tariffs, trade barriers and subsidies in their trading practices. The president has been at odds with key allies over the new tariffs, which dominated his talks with the leaders of major industrialized nations in the Canadian resort town. In addition to the U.S. and Canada, the group includes Britain, Italy, France, Germany and Japan. The president said the U.S. was “pretty close” to reaching an agreement on the North American Free Trade Agreement with Canada and Mexico and had discussed two types of sunset provisions in which any of the countries could leave the deal. Trump said the final outcome would lead either to a better agreement on NAFTA or separate trade deals with both Canada and Mexico. 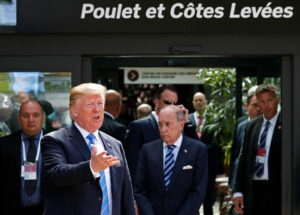 Shortly before his arrival at the two-day summit, Trump injected additional controversy by suggesting that the G-7 offer a seat at the table to Russia, which was ousted from the group after it annexed Crimea in 2014. The president said Saturday that re-admitting Russia to the elite club would be “an asset,” telling reporters, “we’re looking for peace in the world.” Trump said he had not spoken with Russian President Vladimir Putin in a while.